I hope everyone had a great Independence Day full of beer, food, fireworks and racism. If you didn’t, may I suggest attending the Fourth of July parade in Norfolk, Neb., next year? In addition to not much else, they have a great parade that features floats like the one above. 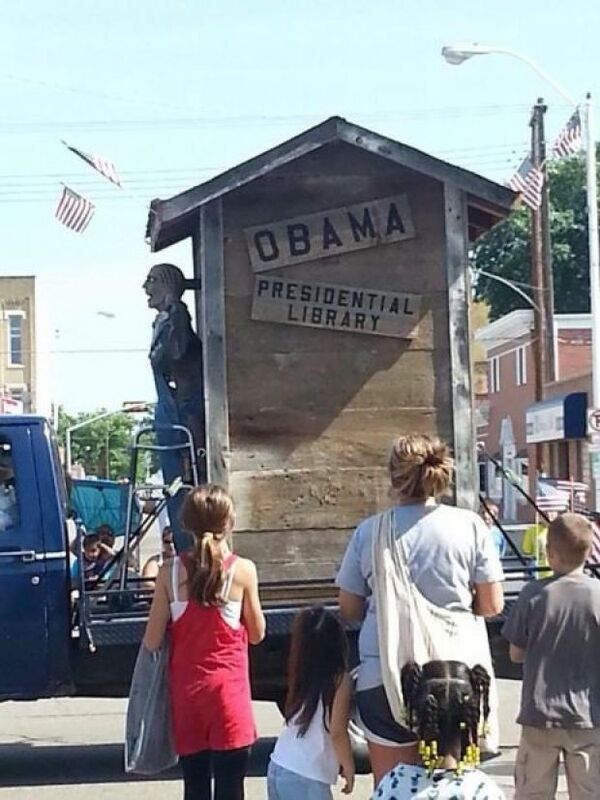 Yes, that float portrays Obama’s presidential library as an outhouse. RACIST! The answer is, “No, not it is not.” People on the far left love racism. They love to hate it because it gives them the ability to take the moral high ground when bringing it up. It’s a win/win situation because anytime someone argues them, BAM! Racist. At any rate, back to the parade float. It’s clearly a political jab at Obama. In fact, the exact same jab was made about Bush Jr. in a political cartoon. Was that racist? Why not? Whenever people automatically throw out the race card because a white person made a negative comment/gesture towards someone who is not white, we are 1) adding to the problem and 2) creating a new problem that never existed. One can argue that automatically assuming racism because a bunch of Nebraska, white, country folk disapprove of Obama is in fact racism in and of itself. Lastly, by calling every negative comment towards Obama racist, you’re devaluing the word and the act of racism. It’s kind of like how feminists want to ban the Rolling Stones’ “Under My Thumb” from grocery stores: once you cross the line to absurdness, we can no longer take anything else you say seriously. If you’re a traditionalist, this is also referred to as the “boy who cried wolf” phenomenon. For those that disagree with these statements, you can call me racist in the comments section below.